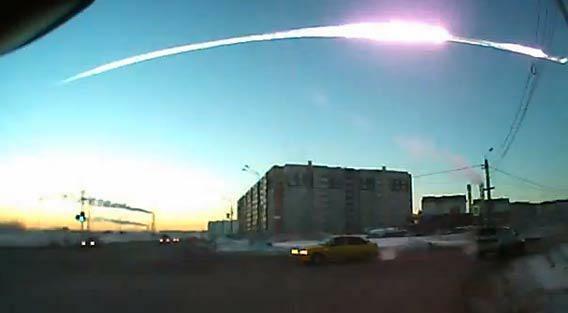 Still frame from a dashcam video of a huge meteor over Russia. 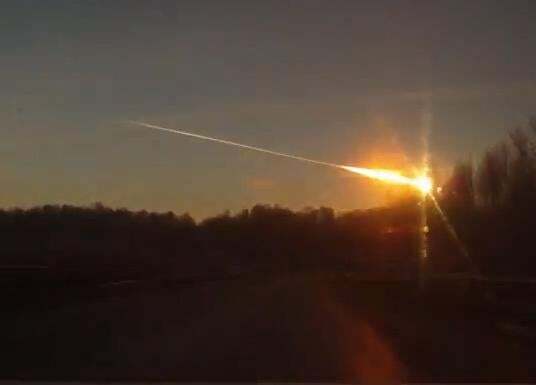 Apparently, at about 09:30 local time, a very big meteor burned up over Chelyabinsk, a city in Russia just east of the Ural mountains, and about 1500 kilometers east of Moscow. The fireball was incredibly bright, rivaling the Sun! There was a pretty big sonic boom from the fireball, which set off car alarms and shattered windows. I’m seeing some reports of many people injured (by shattered glass blown out by the shock wave). I’m also seeing reports that some pieces have fallen to the ground, but again as I write this those are unconfirmed. Note: This is almost certainly unrelated to the asteroid 2012 DA14 that will pass on Friday. See below for details. Dozens of videos are popping up on YouTube, and some are incredible. This one from a car’s dashboard camera shows the meteor coming through the atmosphere. This one is even more amazing: it shows the trail of smoke in the sky, and 27 seconds in the shock wave—the sonic boom—passes over. It’s loud. My heart was pounding watching those. I have to admit, at first I was thinking this was an elaborate hoax, but the reports are coming in from everywhere. The videos show it at many different angles. I’m trying to piece together what happened from the videos. First of all, I do not think this is related in any way to the asteroid 2102 DA14! For one thing, this occurred about 16 hours before DA14 passes. At 8 kilometers per second that’s nearly half a million kilometers away from DA14. That puts it on a totally different orbit. For another, from the lighting, time of day, and videos showing the rising Sun, it looks like this was moving mostly east-to-west. I may be off, but that’s how it looks. DA14 is approaching Earth from the south, so any fragment of that rock would also appear to move south-to-north. Another dashcam shot from a different car. So again, I think this is unrelated to 2012 DA14. But wow, what a huge coincidence! I don’t know how big the meteoroid (the solid part) of this was. The information is too scattered; we’d need the position of the people who took the videos to triangulate and see how far up the debris trail is, for example. I’ll note that people were taking video of the trail for some time before the explosion is heard, which is consistent with it being the shock wave from the passage of the meteoroid through our atmosphere high above the ground. I know a lot of folks will think that’s the sound from the explosion due to impact, but it’s more likely to be the sonic boom from something big moving at multiple times the speed of sound through the air. As far as impact goes, the most likely scenario is that this broke up many kilometers above the ground, and may rain down chunks. Many large meteors do this, with meteorites (the pieces that fall to the ground) found downrange. Once the fall is found, we’ll be able to get a better idea of how big this thing was, and of course what it was made of (rock, metal, a mix of both). I’m trying to track down reliable reports of actual impacts. The train (the term used for a meteor trail) is interesting indeed. It appears to split, so I’m guessing the main mass split there. That’s not surprising; it’s happened with previous falls (like Sikhote-Alin). That means they could have disintegrated at different times, so there may be multiple places where pieces could fall. For now, that’s all I have. I’ll update this post as I hear more.